Foam Roofing Is A Great Addition To Nearly Any Roof Type! Are you looking for a lightweight, durable, and cost-effective roofing solution for your commercial roof? 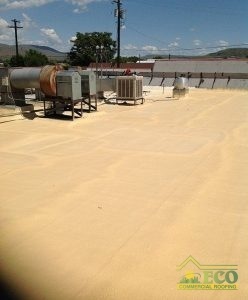 At ECO Commercial Roofing, we are dedicated to providing our clients with a wide range of roofing services to choose from, and among our services, we are proud to offer commercial foam roofing as a form of commercial flat roof repair in Texas, Louisiana, and Mississippi. With this technique, we can help eliminate nearly any commercial roof damages. To learn more, or to request a quote, give us a call today at (833) 200-0571! We have more than 20 years of experience, and we only work with high quality Conklin products. So what is foam roofing, and why should you choose it for your next roof? Foam roofing is exactly what it sounds like. Using a high grade, fast curing foam, we coat the entirety of your roof, in lieu of scattered applications of commercial flat roof repair. This not only addresses any existing damages such as leaks, cracks, or punctures but also defends against future damages from occurring. Furthermore, foam roofing is a cool roof, which means that it reduces the amount of heat on your roof, which can lower your energy costs throughout the year! They are also considered green roofs, since they can be applied over your current roof, reducing landfill waste. All of these benefits and more make foam roofing a fantastic choice for nearly any roofing system, from commercial to residential. If you are interested in learning more about how commercial foam roofing is a reliable form of commercial flat roof repair Texas, Louisiana, and Mississippi, give us a call today at (833) 200-0571! We have more than 20 years of experience in the roofing industry, and we are expert in all types of roof restoration. Foam can be applied to a variety of roof surfaces, including metal! With a foam roof on your building, you can say goodbye to leaks, ponding, cracks, and more. Foam will thoroughly seal all seams on the roof, and resist the effects of UV damage. Invest in your business today with a high quality Conklin foam roof application.